Almond extract is 35% alcohol. It is all natural and has no added sugar. It is used in baked goods, pancakes, waffles, frosting, and ice cream. Almond Extract enhances the flavor of cherries and peaches in baking, making it great in pastry fillings. It is also great for salad dressings and marinades. Anise Extract is typically used for baking. With its licorice flavor, it works well in recipes that feature spices like cinnamon, clove, or nutmeg. Try it in cookie batter, cakes, biscotti, and coffee cakes. One teaspoon of Anise Extract is equal to two teaspoons of ground anise seed. GLUTEN FREE, has NO MSG, NO SODIUM, NO SUGAR. 100% Pure vanilla extract is made by macerating and percolating vanilla beans in a solution of ethyl alcohol and water. The FDA requires this solution to contain a minimum of 35% alcohol in order to be called pure; ours contains 35%. 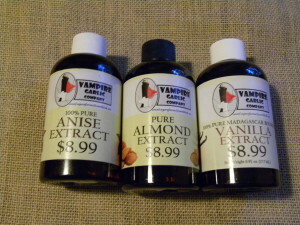 Vanilla Extract is a common ingredient in many baked goods, whipped cream, and frosting.